Whether it’s a portable or window model, 8000 BTU air conditioners provide one of the best solutions to deal with cooling and heating issues in small to medium-sized rooms. Considering that there is a wide variety of these units on the market, it can be really hard to know which unit is ideal for your particular room and needs. To make things easier for you, we have assembled a list of the best 8000 BTU air conditioners you can find on the market. This list is comprised of both portable and window models to give you several options to choose from. Read through and we are certain that you will find a unit that will address all of your particular needs. Be sure to review the qualities below if you are unsure about how to pick one of these top models. When it comes to purchasing an air conditioner, you should be sure to check how much it weighs, just in case you need to move it around from time to time. Preferably, look for a model that weighs between 40 to 60 pounds. We know you would not want to purchase an air conditioner that occupies too much space in your room or office. Hence, it always advisable to check a unit’s dimensions; for instance, one with 14.4 x 17.3 x 11.1 inches would be a good fit for a small room. This an important aspect too; you obviously want a model that serves two masters at once. Buying an air conditioner that can be used in both cold and humid areas is the best idea since it is economical. It is advisable to look for a model that saves energy while running in order to avoid huge electricity bills. You could choose the one that meets the Energy Star requirement, as this will help you save 25-20 percent of energy monthly. When looking for an air conditioner, ensure you purchase one that has a remote control so that you can operate it easily. Now that you know how to choose one of these, let's dive into the review. 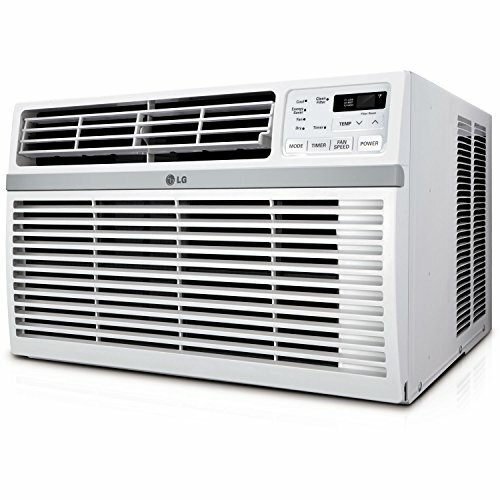 The LG LW8016ER is one of the most efficient window AC units available on the market, as it is well built and has some amazing features. 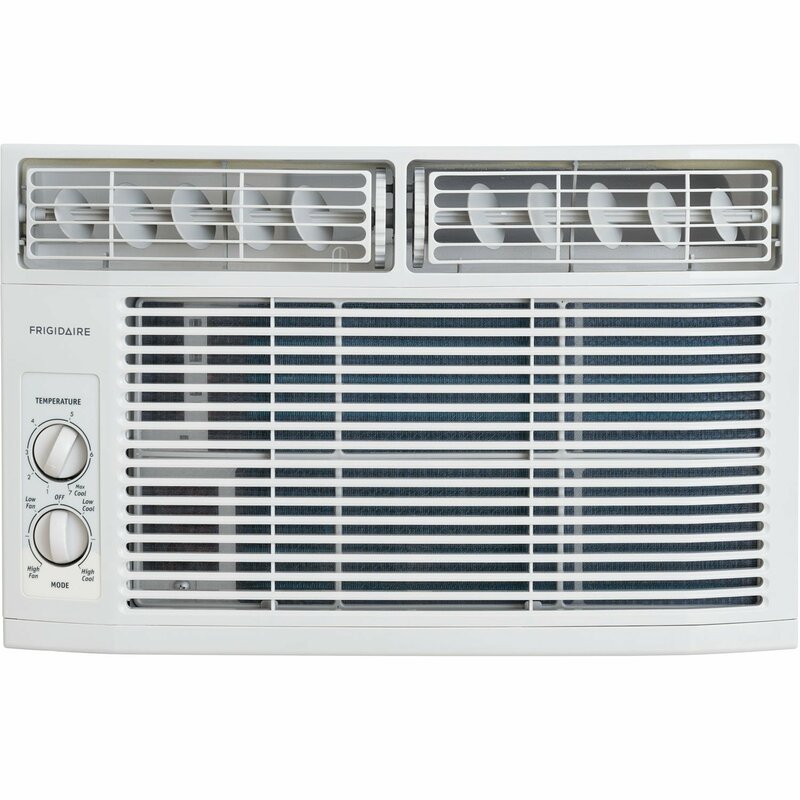 It’s the best overall window AC on our list, striking a perfect balance between performance and price. Rest assured, this unit will give you the best value for your money. One major reason why this unit is the best overall window AC is that it helps you save up to 15 percent of energy in one year. Additionally, it has an EER of 12.1, which helps you save some power. It has a cooling capacity of 8000 BTU and conveniently cools a room of up to 340 square feet. Moreover, it has 3 cooling and fan speeds which gives you the privilege of adjusting the temperature range to your desire. It has a dehumidifier that can extract 2.2 pints per hour. It also has air filters for removing dirt from the air. Furthermore, this model is easy to use since it comes with a remote. While running, it produces 50 decibels, making it a bit noisy; however, you can install it in your bedroom and still have a good night sleep. This unit comes with a manual, making it easy to install. Furthermore, most window ACs are very easy to install. It is one of the most portable models since it only weighs 28 pounds. When it comes to size, this unit is 19.6 inches wide, 12.4 inches tall, and 19.4 inches long, a small size for a unit with such performance. It features an energy saver function, sleep mode, and 24-hour on/off button. This model moves 200 cubic feet of air each minute, which cools a place fast. If you are looking for a model that is economical in terms of energy preservation, small and really portable then this is the best choice you can get from the 8000 BTU air conditioners. When it comes to portability, this is the best model you can choose. It only weighs 52.9 pounds, meaning you can easily carry it from one place to another. Having a cooling capacity of 8000 BTU, the BLACK+DECKER BPACT08WT can efficiently work in a room of up to 150 square feet. Additionally, it has 3 cooling and fan speeds for you to adjust the temperature. It also has a dehumidifying mode and it is designed to produce fresh air for your entire house in vertical motions. Additionally, it is remotely controlled, hence you can regulate the speeds of temperature from the comfort of your coach. This AC unit features filters that clean under exposure of fresh air. When running, it produces 75 decibels of sound and comes with a manual for you to easily install. This unit also saves a lot of energy since it meets the 2016 Energy Star requirement, which saves 15 percent of energy use. It is also very compact, 16.5 x 11.5 x 26 inches to be precise. If you have been looking for an 8000 BTU air conditioning model that can conveniently work in all rooms in one house, then this is the best option. It will save some amount of money due to its energy efficiency. It also does not occupy much space. A programmable timer to automatically switch the machine on and off. It does not meet the Energy Star requirement standards. This model is meant to be horizontally mounted on windows in case you are looking for a window AC. The Frigidaire FFRE0833S1 can cool a room of up to 350 square feet. It has 3 different cooling fans, so you can regulate the temperature; it also has a dehumidifier that can extract 1.7 pints each hour. This unit features antibacterial filters that remove dust, bacteria, and bad odors so your room will not be stuffy. 2 louvers direct airflow in circular upward motions. You can control the unit using a remote and easily install it on your own since it comes with an installation kit. It also features a timer that helps you program the AC on and off automatically. Unfortunately, this unit does not meet the Energy Star requirement and does not help you save much energy, even though it has an energy saving mode. It only occupies a small space of 16 x 18.5 x 13.4 inches. 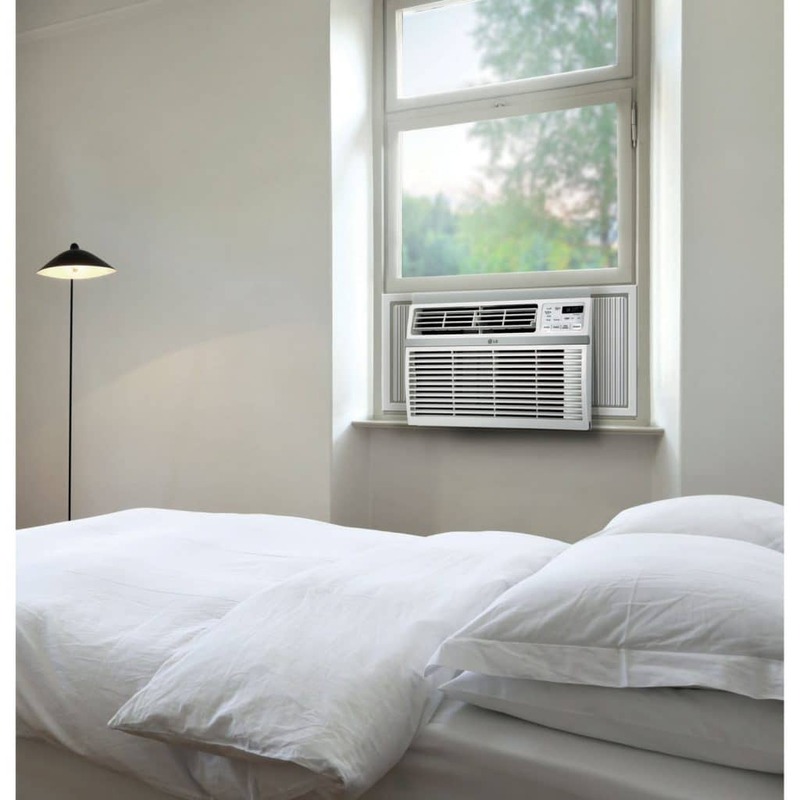 In short, if you want a window AC that you can easily install on your own, then this is the best option we have. You will also be able to program the AC to automatically switch itself on and off. 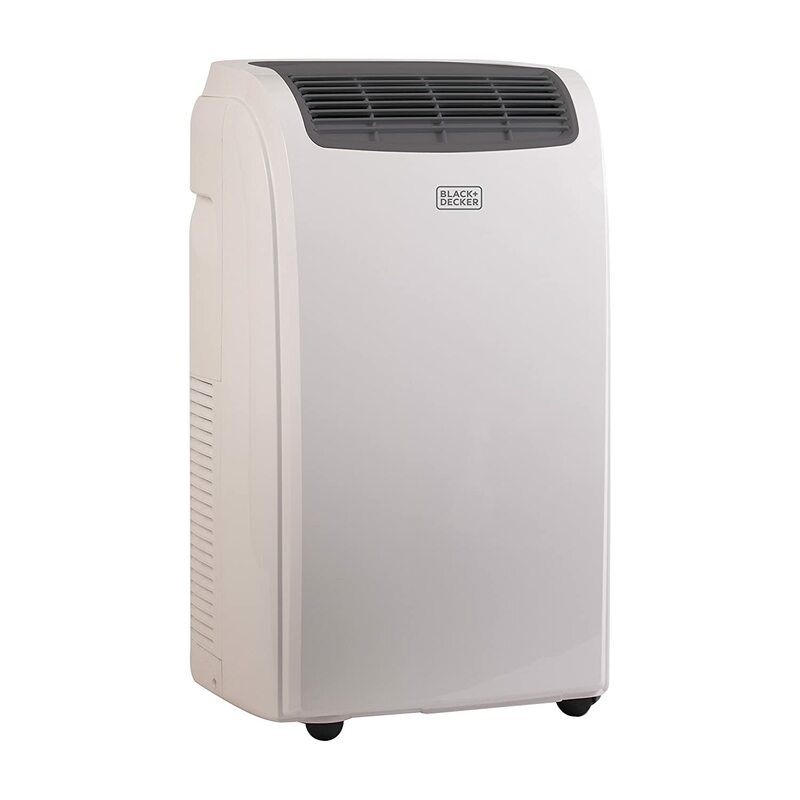 This 55-pound window AC is highly portable, hence we would recommend it if you are looking for an AC that you can move around easily. The Honeywell MO08CESWK uses its cooling capacity of 8000 BTU to conveniently cool a room of up to 350 square feet. You can also use its temperature ranges from 60 degrees to 89 degrees. It has 3 cooling and fan speeds to choose from: fast, moderate, and slow. This unit also features a dehumidifier capable of removing 1.8 pints per hour from your home. Its dust filters can be easily re-washed since they are very accessible. It also has an exceptional flow to keep your room fresh and sports a remote control for convenient operation. Furthermore, this unit does not produce much noise, has an installation kit so you can install it with much ease, and is environmentally friendly. The MO08CESWK does not occupy a big space as well, only 28 inches. Additionally, this model has handles that you can use to grasp it while moving it from one point to another. If you are planning to purchase an air conditioner that you can easily carry around with grasp handles, that is environmentally friendly, and that also occupies less space, then this one is the best. Will efficiently cool rooms of up to 350 sq. ft. 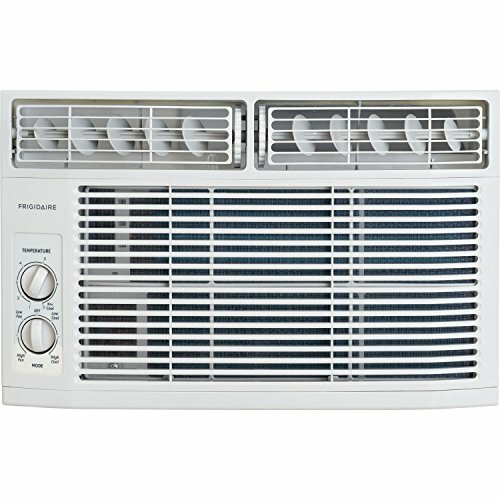 If you have been looking for the most economical window AC then we have come up with the best answer. Like the Honeywell MO08CESWK above, this Frigidaire FFRE0833S model has a cooling capacity of 8000 BTU and will also work well in a room of up to 350 square feet. You can regulate the temperature range with 3 different speeds and control air distribution in 8 different ways. Additionally, this model gives you the advantage of dehumidifying your room at a rate of 1.7 pints per hour. It will remove any impurities and pollen from your room with its air filters. You can operate it with ease since it has a remote. It produces 54 decibels while operating. You do not have to worry about the installation process since this unit comes with a manual. Furthermore, it weighs 52 pounds, which is relatively light to carry around. 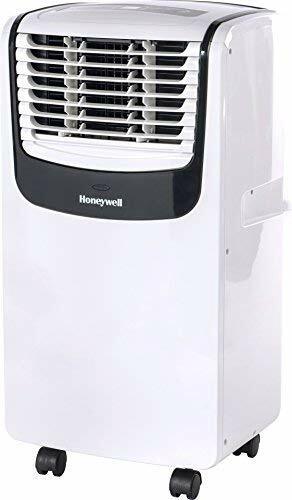 If you are looking for an air conditioner with a price that is pocket-friendly and that you can easily mount on the window by yourself, this one right here is your best option. It will also come with a remote, hence you will find it easy to operate. Furthermore, you can program this AC to switch itself on an hour before you return home; this means that during those cold winter days you can come home and find your house warm. 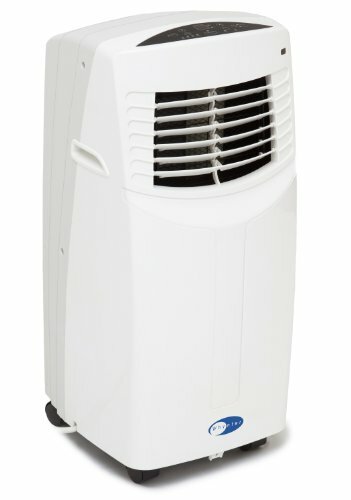 Looking for an air conditioner that is lightweight to carry around? This air conditioner is very portable since it only weighs 64 pounds. 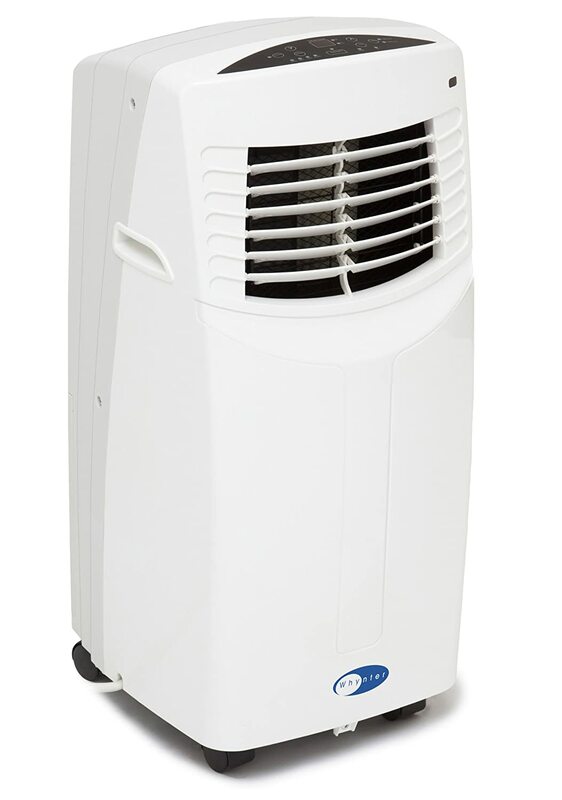 The Whynter ARC-08WB has a cooling capacity of 8000 and works well in a room of up to 250 sq. ft. Furthermore, it has a dehumidifier which helps cool off your room at 45 pints every 24 hours. 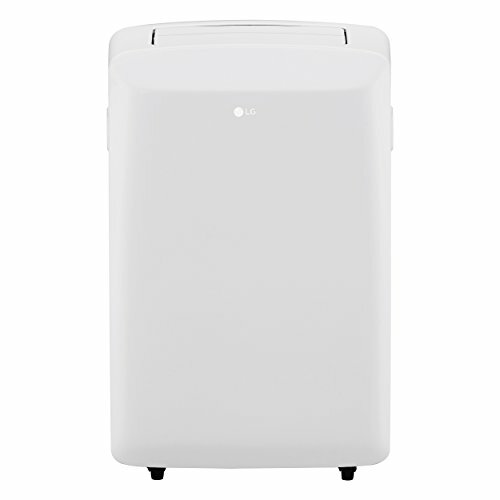 This unit’s air filters, which you can wash and put back, help to eradicate any pet hair in your room, as well as smoke and dust. It also has a two-way directional louvre and air in your room will flow at 270m 3/h/159 CFM. Additionally, it is easy to operate since it has a remote. This model produces 53 decibels when running, which is relatively low. The ARC-08WB comes with an installation kit and a very clear user manual, so installation won’t be that much of a challenge. It does not occupy much space since it is only 17 x 28 x 13.6 inches. With 1.8 EER, it will not consume much of the energy, meaning that your electricity bills will not be as high. You should look no further if you want an eco-friendly lightweight air conditioner to use in your sitting room. It also comes with an installation kit and filters that remove smoke and dust particles from your home. 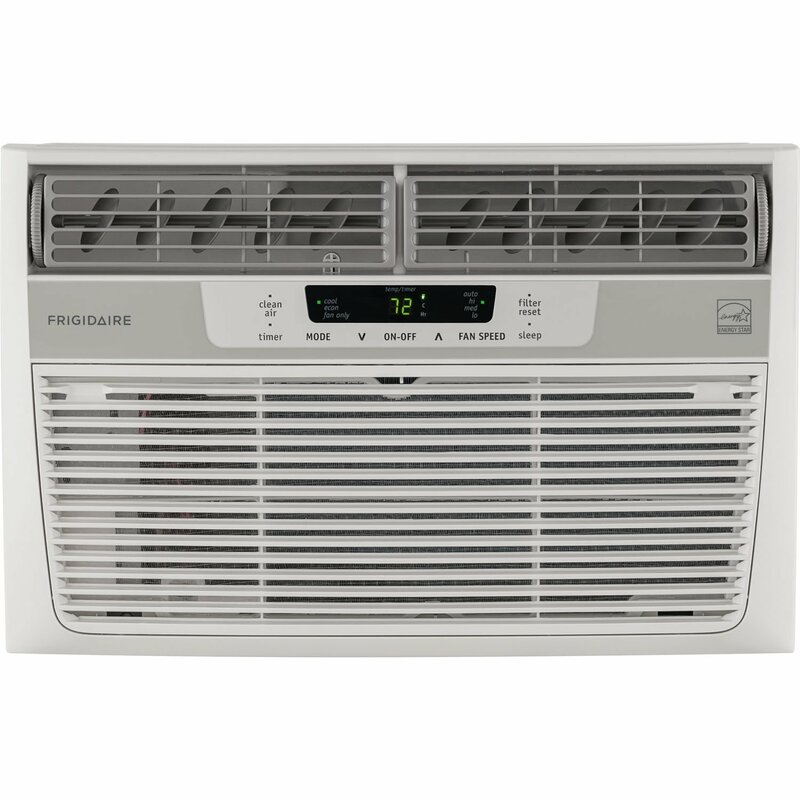 If you are a light sleeper or are looking for an AC that won’t make noise above a whisper on the highest setting, then the Frigidaire FFRA0811R1 is a unit worth considering. 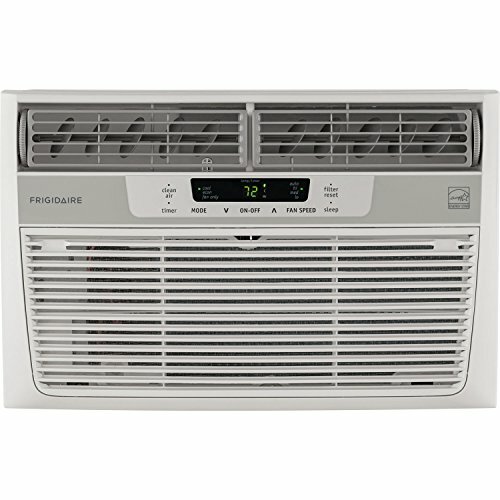 This is a great AC to use in your bedroom, as it doesn’t make as much sound as the other models on our list. At the highest setting, the unit produces around 60.1 dB of noise; while at its lowest setting, it produces around 55.7 dB. For a window AC that’s a pretty decent range. The FFRA0811R1 can comfortably cool of up to 350 sq. ft. and has 2 cooling and fan speeds. Furthermore, if you buy this model it will as well serve as a dehumidifier, with the capability to remove around 1.7 pints of moisture per hour. It has filters than freshen up your room, eradicate bad odors, and remove dust particles. You can control the air distribution with 8 different parts. The model comes with well-labeled buttons on the display to regulate heat. It is also easy to install since it has a guide that instructs you on how you are supposed to mount it on the window. If you want to shift it from one place to another, you’ll find it easy to do so since the unit only weighs 53 pounds. Moreover, this model occupies very little space in your room, only 15.5 x 18.5 x 13.4 inches. It also has a sleeper mode and timer feature. 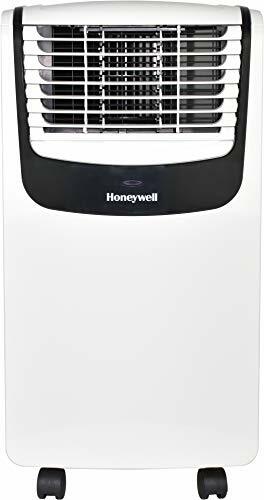 This model is the right choice if you are a light sleeper or are looking for an AC to install in your infant’s room because it is the quietest air conditioner on this list. It also comes with a manual for installation and does not occupy much space in your room. 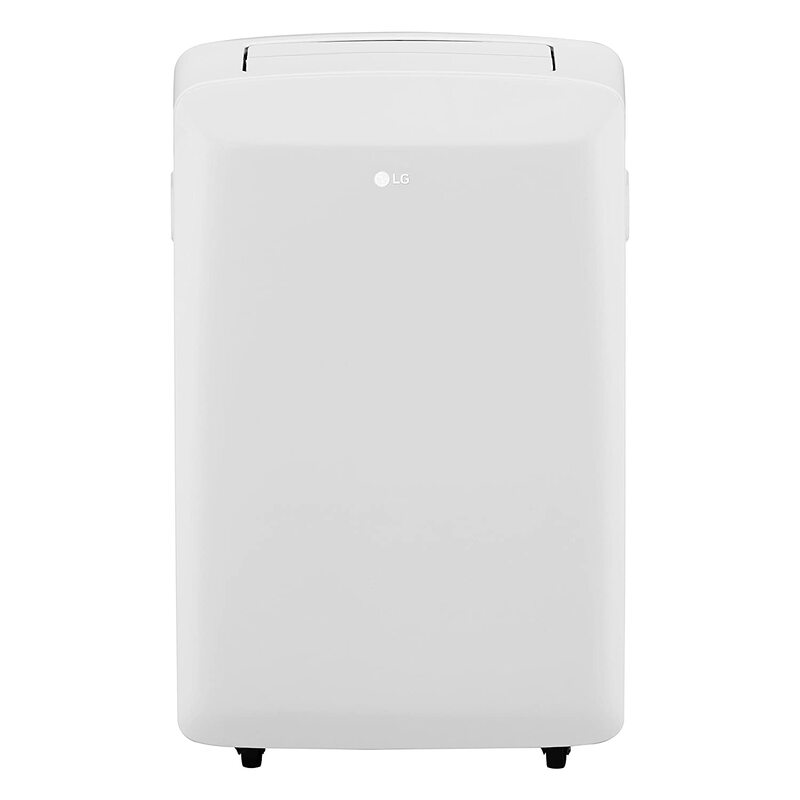 The LG LP0817WSR is a good choice for those who are looking for a portable AC that also does not produce a lot of noise. The unit produces 53 dB when running on the highest setting. With such a low noise level, it is unlikely to distract you while you are having a nap. The LP0817WSR only weighs 56 pounds, so you can move it around easily. Its 8000 BTU cooling capacity can quickly cool a room of up to 150 square feet. You can use the 2 cooling and fan speeds to regulate temperature in your home. Furthermore, if you want to save more energy you can easily switch to power saving mode. Additionally, this AC comes with a dehumidifier of 1.8 pints per hour; this feature is important if you are living in areas with high humidity. It also has auto swing louvres and has an indicator that shows when the water is full. It has a remote you can operate with. When it comes to installation, you can do it yourself since it only needs to be mounted on the window and has an installation kit. It also has an evaporation system. This unit also features an LED display mode and a timer that you can use to program when to automatically switch itself on and off. This is a portable model; if portability is a priority in the air conditioner you are looking for, keep in mind that this one only weighs 53 pounds. It comes with an installation kit and has a power saving mode that helps you save energy while running it. We would like to advise you to take all these aspects into consideration when purchasing an air conditioner since they are all vital. The above-mentioned air conditioners may differ in a few aspects; for instance, some may have energy saving modes whereas others do not but they all work efficiently. Therefore, you should choose the one that you find the most convenient. We would like to answer some questions that we often get from people in order to help you choose the best air conditioner. How many Amps Does An 8000 BTU Air Conditioner Draw? What Size Room Will An 8000 BTU Air Conditioner Cool? It comfortably covers a room of up to 350 square feet. How Many Watts is an 8000 BTU Air Conditioner? It has a maximum of 740 watts.